(From Nikon lens literature) High powered 4.3X telephoto zoom lens. Rotating zoom ring. ED glass for high resolution and high contrast even at maximum apertures. This lens has been in Nikon's lineup for some time now, and it unfortunately shows in its optical performance. It might have been fine in the days of film, with that medium's lower resolution, but the microscopic pixels of modern DSLRs make higher demands. Stopped down a bit at short and medium focal lengths it's actually pretty decent, but it's very noticeably soft at any aperture at 200mm, and even more so at 300. Wide open, it's pretty bad at any focal length. If you could get a great deal on a used copy and only cared about shooting stopped down a bit from 70-135mm, you might make a case for it, but it's hard to recommend as a new, full-price purchase. The Nikkor 70-300mm f/4-5.6D's chromatic aberration pretty much follows its sharpness behavior: It's not at all bad from 70-135mm, but deteriorates from there, with very high CA in the corners and edges at 300mm. As you'd expect from a lens designed for full-frame use shot on a subframe camera, shading is excellent. Wide open, it's about a quarter of an f/stop at all focal lenths, quickly dropping to less than 1/10 EV when stopped down. 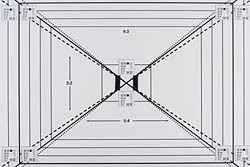 Geometric distortion ranges from slight (0.14%) barrel distortion at 70mm to a maximum of 0.35% pincushion at 135mm, decreasing slightly to 0.3% pincushion at 300mm. This lens employs Nikon's older screwdriver-drive arrangement, relying on the body's AF motor for focus operation. This means its slower than more recent models that use Nikon's ultrasonic motor technology, taking close to two seconds to slew from closest focus to infinity. The lens is somewhat noisy while focusing, but far from the worst we've heard. The drive arrangement also means that you must explicitly switch it to manual focus mode to manually adjust it. Manual adjustment is relatively easy though, with plenty of barrel rotation for making accurate settings. Macro performance isn't bad for a tele zoom , the minimum coverage area was 98mm (3.9 inches) on our 20D test body, with a lens to subject distance of 185mm (7.3 inches) at 300mm focal length. This is definitely an external zoom/focus lens, as the barrel extends about 50mm (nearly 2 inches) when zooming, and another roughly 17mm when focusing. The lens barrel doesn't rotate while zooming, but does rotate while focusing, potentially an issue with polarizers and graduated neutral density filters, or any other auxiliary optical component that's rotation-sensitive. Mounted on the camera, the relatively light weight of this lens provided good balance on our D200 test body. It might a bit front-heavy on a smaller body like the D80, but I don't think excessively so. This VR lens has roughly similar specifications to the 70-300mm f/4-5.6D, but includes Nikon's Vibration Reduction technology and offers dramatically better optical performance. Sharpness is much better overall, and especially when stopped down slightly, distortion is a bit lower, while chromatic aberration is similar. Almost twice the price of the 70-300mm f/4-5.6 D, but the optical quality is so far superior that the Vibration Reducion comes almost as a bonus. A much better value for the money, well worth it if you can afford the cost differential. A wider zoom range, much better optical performance, and VR besides, but at the cost of vastly greater bulk and a much higher selling price. Not as much at the telephoto end and a considerably higher price, but vastly improved optical quality and a very large f/2.8 constant maximum aperture. Slightly lighter build quality, but marginally better optical performance at a lower selling price. It's still no prize optically, but the Tamron beats the Nikon optic in our tests, and its price is hard to beat. It's reasonably priced and reasonably well-constructed lens, but the Nikon 70-300mm f/4-5.6D really doesn't make the grade optically, at least not at its longest focal lengths. It's OK at shorter focal lengths, but if you don't need a 300mm zoom, you'd probably be better served by looking at 70-200mm models in the first place. If you do want the full 70-300mm range, you can get (slightly) better performance from the Tamron 70-300mm f/4-5.6 Di LD for less money, or dramatically better optical performance from the Nikon 70-300mm f/4.5-5.6 ED-IF AF-S VR for about half again the cost, and with the added benefit of Vibration Reduction built in. To see the sample shots from this lens captured with this lens on our D200 test body, just click on either of the thumbnails below, and scroll as needed in the window that appears. The main reasson i bought this lens was for budget reassons. I didn't want to spend more money, but i also didn't want the 'chaep' version. It also has an extra aperture ring. Allthough the lens performed good in the 70-200mm range, i found it almost impossible to use the 200-300mm. The slow focus speed and the f5.6 was to much for me. 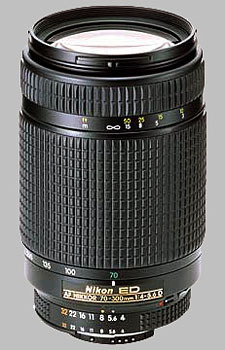 I sold this one and now i own the Nikon 70-300mm f/4-5.6G VR AF Nikkor. Buy it when you originally wanted the non-ED version. Don't buy it if you can manage to spend a little bit more to get a VR-ED version. Like a childhood sweetheart this lens was great when I was starting out in slr world but now I'm older and more mature (cough) and this just doesn't satisfy my needs. I was able to make a lot of good shots with it at day time family occasions and kids sport, but as soon as you're working an event as a payed photographer under pressure, then you need a speed, responsiveness and ruggedness this lens simply can't deliver and realistically shouldn't for the price. 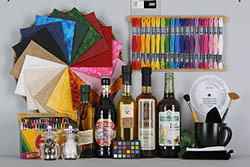 Great for beginners or amatuers who use their cameras socially. The metal mount and ED element should ensure a higher resale value as well. Great starter telephoto lens. The long focal length is what I wanted for capturing birds and animals at a distance. At the time I really wanted IF and SWM but they were not available on a zoom of this length or price range. But now that the 70-300mm VR is out, I am upgrading. The lens is nice and compact and light. It's ver y easy to carry this around your neck all day. The f/4-5.6 is fast enough especially considering the price jump to faster lenses. Picture quality is great, I consider it on par with my 18-70mm kit. Only problem is slight softness on the 300mm range but this could also be contributed to lens shake. I would not recommend using a polarizing filter on this due to the fact that the barrel rotates as it focuses thus causing you to readjust the filter constantly. I would recommend this to amateur photographers just starting out and want to try their hand with a telephoto lens. The maing reason for buying this lens was to use its huge focal length, however the image quality at long end is really disappointing, too soft to be true, to my taste is only useful from 70mm to 150mm. Autofocus is also disappointing: Slow. Built Quality: It feels cheap plastic. This lens has very wide sample variation, some are rubbish end to end, some are good at the wide end some at the telephoto. My lens was cherry picked, and 100-300mm it is very sharp, it goes off a little at the wider end. At 300mm f6.3 it is knock out, with very little CA, pin cusion, and is pretty flare resistant. I picked up this lens as i wanted a ligher lens for travel and walking than the 300mm f2.8. My only main nit is that the AF is a little sluggish, an AF-S version would be nice, even better would be a VR version. I bought a used copy of this lens as a companion to my 18-70mm on my D70s. This is no 80-200mm or 70-200mm VR, but for the price, I have been quite happy with the images this lens produces, and the smaller size allows me to carry it in my camera bag that I wouldn’t have been able to do with either of those pro-zooms. Compared to the 18-70mm at 70mm, the lens is not quite as sharp and suffers a bit more from CA, but images are quite good so long as you are not stopped down past f/16 - at which point things become considerably softer. Additionally, as you've probably read elsewhere, I recommend avoiding anything much past 200mm if you care about sharpness. Bokeh is also poorer than the 18-70mm, so if you are looking for a zoom portrait lens, look elsewhere. Build quality is decent, although my particular example has a pretty loose zoom ring which is susceptible to 'un-zooming' if I shoot at any sort of an upward angle. I did try a new example at a local camera store and the zoom mechanism was considerably stiffer, so take that for what it is worth. As is the case with all lenses, consider what you are going to use the lens for before making a purchase. If you are just looking for a carry around zoom that will yield good photos in the 70-200mm range, I recommend this lens. If you need a faster lens or something that will be tact sharp across the entire zoom range, plan on filling your bag (and emptying your wallet) with something bigger. From an image quality standpoint, this lens is a bit better than the other consumer grade tele-zooms. Image quality is good throughout the zoom range, and improves as the lens approaches f/8. At the 200-300 end of the zoom, the lens shows an increasing drop in contrast and show more and more softness. The softness improves past f/8 to about f/11 but the overall lack of contrast and flat color does not. Now having said all of that, it is really not a bad lens. If you don't want to carry a heavy and expensive f/2.8 with you on vacation, then this is not a bad alternative. It takes good pictures if you stop it down a bit and stay away from full zoom. It is the best sub-$1000 telephoto zoom currently available from Nikon. I do have a couple of nagging problems with this lens. The first is that the manual focus ring is a mess. It is too loose for my taste to begin with, but the markings are the real issue. It does not have any indicator to show the focus distance even though they are marked on the ring. To further frustrate, there are no DOF markings. Second, my lens creeps out if it is hanging from your neck. This is very annoying to me. If you put the lens at 100mm and point the lens down, it zooms. When you are checking frames on the LCD this is quite annoying because when you bring the camera back up to your face it is at a different focal length. Last, the included hood is a cone style that is also not marked. It is a pain to install, but it will reverse on the lens for storage.